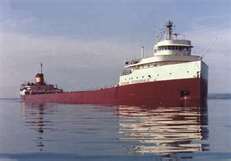 Every November 10, I reblog my post on the Edmund Fitzgerald. 42 years seems like a long time to most of us, but to the families of the crew lost, it must seem like yesterday. Ever since I moved to Michigan, and especially since I have now been to Whitefish Point and seen the bell and the other ephemera at the Shipwreck Museum, it is even more poignant. I hope you will read, enjoy, and comment on the story. It would be especially interesting to hear your memories. November 10, 1975. Do you remember? I remember it well. I can still “see” Harry Reasoner sitting at his desk on the evening news talking about the apparent loss of the ship “Edmund Fitzgerald” and crew of 29. For some reason, it struck me – viscerally. Perhaps it was because we were so used to seeing great ships going under the Sunshine Skyway Bridge (although they were not nearly as large as the Great Lakes freighters). I remember following the story at the time. I never forgot the sadness I felt. Then, too, there’s that song…it’s one of those that sticks in your head and takes forever to get rid of. The last voyage of the Great Lakes Freighter “Edmund Fitzgerald,” captained by Ernest M. McSorley, started in Superior, Wisconsin on November 9, 1975. The “Fitz” was loaded with over 26,000 tons of iron ore pellets. 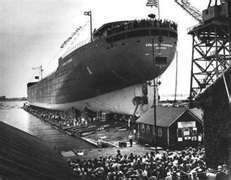 The ship was scheduled to transport the cargo to Zug Island on the Detroit River. She left port with the Arthur M Anderson whose captain was Bernie Cooper. It was determined that the Edmund Fitzgerald would take the lead as she was the faster vessel. Both captains were acutely aware of a building November storm entering the Great Lakes. Captain McSorley and Captain Cooper agreed to take the northerly course across Lake Superior, where they would be protected by the Canadian shore. They would later make a turn to the southeast to eventually reach the shelter of Whitefish Point. Weather conditions continued to deteriorate. Gale warnings had been upgraded to storm warnings early in the morning of November 10. While conditions were bad, with winds gusting to 50 knots and seas 12 to 16 feet, both Captains had often piloted their vessels in similar conditions. There were no more extraordinarily alarming reports from Captain McSorley that afternoon. However, at around 5 p.m., a wave smashed into the Anderson smashing its starboard lifeboat. Winds were reported to be almost 60 knots steady, with gusts to 70 knots. Seas were running 18 to 25 feet. Again, from the GLSM website, “According to Captain Cooper, about 6:55 pm, he and the men in the Anderson’s pilothouse felt a “bump”, felt the ship lurch, and then turned to see a monstrous wave engulfing their entire vessel from astern. The wave worked its way along the deck, crashing on the back of the pilothouse, driving the bow of the Anderson down into the sea. The first mate of the Anderson spoke to the Fitzgerald one last time, about 7:10 pm. “Okay, fine, I’ll be talking to you later.” The mate signed off. The radar signal, or “pip” of the Fitzgerald kept getting obscured by “sea return,” meaning that seas were so high they interfered with the radar reflection. Around 7:15 pm, the pip was lost again, but this time, did not reappear. The Anderson’s First Mate called the Fitzgerald again at about 7:22 pm. There was no answer. 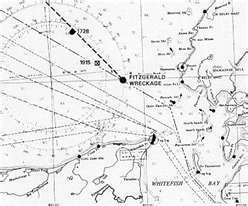 Captain Cooper kept asking the few other ships in the area if they had seen or heard anything from the Fitzgerald. As there had been no word, he persisted with the Coast Guard. Captain Cooper and his crew had just managed to pilot the Anderson to safety in Whitefish Bay. They were all breathing a huge sigh of relief when the Coast Guard made a huge request of them. There were no Coast Guard ships in the immediate area. Could the Anderson go back out into the storm to look for the Fitzgerald? I can’t imagine the anxiety. Here they had just reached safety after being hammered by a huge storm including two huge, rogue waves (called “two sisters” in maritime lingo), but the seaman’s unwritten code is that you go to try to help fellow seamen. The Anderson became the lead boat in the search. The Anderson was again severely pounded by the storm and was rolling badly, but they were able to locate the Fitzgerald’s two lifeboats (empty) and other debris, but no sign of survivors. The William Clay Ford also left the safety of Whitefish Bay to help. These two were later joined by two Coast Guard cutters and a fixed-wing aircraft. The Coast Guard continued the search. On November 14, a specially-outfitted, U.S. Navy plane got a strong signal 17 miles off Whitefish Point. In the next few days, the Coast Guard cutters used different technologies (including side-scan radar) to check that area. One of them located two large pieces of wreckage on the bottom in the same area. A similar search took place in late November. However, winter was closing in. There would be no chance to continue until spring. As large as the Great Lakes are, Mother Nature and winter are stronger. The Lakes become impassible with ice. In May of 1976, they returned to try to determine if these sonar responses were, indeed, the wreckage of the Edmund Fitzgerald. Navy submersibles took thousands of feet of video and hundreds of still photos. 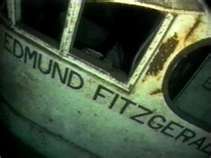 On May 20, 1976, all question as to the final resting place of the “Fitz” was removed as photos were examined and the name “Edmund Fitzgerald” was clearly seen on the stern, upside down, 535 feet below the surface of the lake. After discussions with the families, a long list of U.S. and Canadian government agencies, and the owners of the wreck, it was determined that a single, significant artifact – the ship’s bell – could be removed from roof of the pilothouse and brought to shore. A replacement bell, inscribed with the names of the 29 sailors who lost their lives on the Fitzgerald, would be returned to the pilothouse. 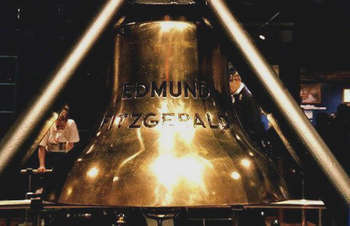 The bell of the Edmund Fitzgerald broke water at 1:25 pm, July 4, 1995 as family members watched. A wreath was placed on the water following the recovery. Family members there that day finally had the opportunity to express their grief, say goodbye and for some, bring closure after 20 years. The replacement bell would be returned to the wreck. The Fitzgerald’s bell was stabilized and then delivered to the Great Lakes Shipwreck Museum at Whitefish Point. From there, the museum continued restoring the bell for use as the centerpiece of a memorial to the men who died in the sinking of the Edmund Fitzgerald. You can see it, today, as the centerpiece of their museum along with a photo of Captain McSorley and additional information about and pictures of the Fitzgerald. 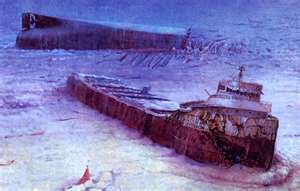 The Edmund Fitzgerald will forever, legally, remain off-limits to divers as it is the final resting place for the 29 souls lost that fateful night. To this day, the true reason for the sinking goes unsolved. Did the Fitzgerald essentially scuttle herself on the shoals in the storm? Were the hatches properly fastened? Did the two giant, rogue waves (the “two sisters”) that hit the Anderson continue to build and swamp an already listing Fitzgerald driving her into the bottom? We’ll never know. There were no survivors to tell the tale. Remember, I really love to hear your comments. Just click on the “Comment” link and let me know what you think. Also, let me know if there’s something you’d like to hear more about. Be sure to “subscribe” to my blog. You will be automatically notified of each new post. Anyone who has known me or followed my blog for a while knows that horses have always been an extremely important part of my life. I’ve often said that when one is born in Kentucky, the very first inoculation is one which ensures love of horses and bourbon. The love of horses kicked in very early with me, and some of my earliest memories are of horses – most specifically, thoroughbreds. Without completely rehashing earlier blogs, Jim and I spent a few years in the thoroughbred breeding and racing business. While we loved the horses and everything about being around them, the business end was not kind to us. As I’ve often said, “If you want to make a small fortune in horse racing, start with a big one.” Let’s just say, it didn’t end well. One of the brightest spots about loving horses is that you can meet some of the most wonderful people on the planet. (Yes, the flip-side is true, too, but we will focus on the good.) One of the best people I’ve ever known I met many, many years ago through the early days of computer networking – on Prodigy. My dear friend, Peggie, and her family became extended family of mine. We talked nearly every day on the telephone. She lived in the heart of horse country, near Lexington, Kentucky. Her love of horses and racing and mine dovetailed forging an amazing bond. She went through the many ups and downs of the horse business with us. She exulted with us over wins and cried with us over tragedies. In September of 2009, I got a call from my friend. She’d been battling cancer and had been quite sick, so it was something of a surprise to hear from her. She said she’d gone to Keeneland to go to the yearling sales hoping it would lift her spirits. I thought that sounded just like her. Go see horses (especially young ones) = feel better. She was actually excited about one she saw there. He was from Michigan! (We had moved to Michigan in 2003, and had been out of the horse business for many years prior to that.) The thing about this colt was that he had a nice pedigree – especially considering that racing in Michigan had become all but non-existent (and, sadly, still is). She said he was so incredibly pretty, well-built, and kind. Her big hook was that he had three Triple Crown Champions in his pedigree. Citation, Seattle Slew, and Secretariat (THAT almost got me), along with a couple of descendants of Northern Dancer – the preeminent progenitor of thoroughbreds in the current era, all figured prominently in his pedigree. Didn’t I want to reconsider having horses? Didn’t I want her to buy him for me? I was laughing because my never-give-up friend was so excited about something. I assured her that owning a racehorse (especially starting with a baby) was just not in the cards. I did promise her, though, that I would keep track of him to the best of my ability. I wrote down his hip number (that’s how they catalog horses in the sale), his pedigree, who had bred him, and followed his sale (for $10,000 to a gentleman from California). In 2010, a 2-year-old horse named Runaway Wildcat started showing up as readying to race in California. Sure enough, it was the colt from the sale. Everything matched.